We are home to major tenants, such as NSLC, Sobeys, and Canadian Tire, as well as many specialty stores and boutiques to fulfill your day-to-day shopping needs. Our mission is to provide top-notch service in a relaxed, inviting family environment. 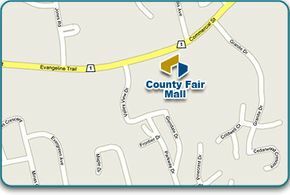 With numerous events and promotions, County Fair Mall is also a great place to socialize. Come see what the Valley’s shopping destination has to offer — get directions to County Fair Mall today! Would you like to hold a fundraiser at County Fair Mall? Visit the Fundraising page for information on how to apply. Visit the Hours page to view our holiday hours.